New York City has a history that it doesn’t like to talk about–much. The first slave auction in the city took place in 1655 at Pearl and Wall Street-then on the East River. In 1703, 42 percent of New York’s households had slaves, much more than Philadelphia and Boston combined. In 1653, slaves built a Wall (known as Wall Street today) to protect the Dutch from Indian raids. In New York, slavery remained economically important. Emancipation came grudgingly, and not completely until 1827. That is just the tip of the iceberg too! When I first found out these things, I was amazed. Never before had I really put it together that the conditions in New York City was just as harsh as the conditions in the Southern States. As for the African Burial Ground that is located in Manhattan, it was a burial ground for many freed and the enslaved Africans. Over half the people buried at the site were children under 12, so that gives us the idea of the mortality rate. Another activity that I did after I found this information was head over to the Brooklyn Museum. There, I found paintings of Brooklyn when it was mainly farm land. Looking closer at the paintings, I was able to see that slaves were drawn and painted into the picture as well. This gave a visual context to the conditions as well as what Brooklyn looked like a long time ago. 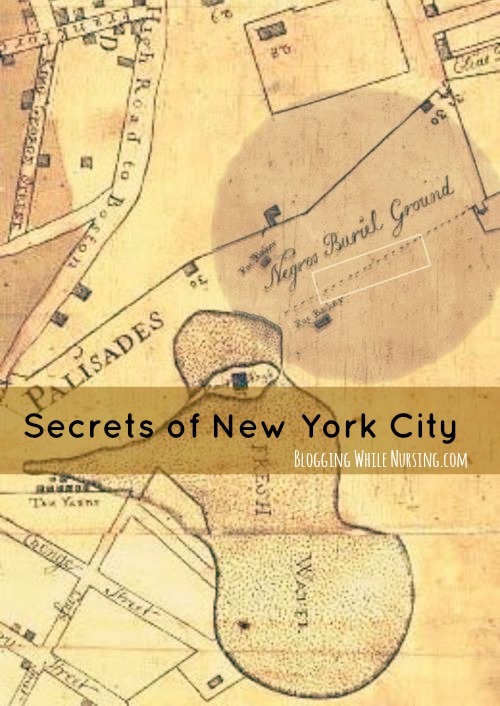 It’s a truly an experience to connect the dots and fully understand how huge slavery really was in New York City, and how much this city depended on it. To know more information about the African Burial Ground, you can check out their website located here. From about the 1690s until 1794, both free and enslaved Africans were buried in a 6.6-acre burial ground in Lower Manhattan, outside the boundaries of the settlement of New Amsterdam, later known as New York. Lost to history due to landfill and development, the grounds were rediscovered in 1991 as a consequence of the planned construction of a Federal office building. Have you heard of the African Burial Ground in New York City? How about slavery in New York City? 17 Comments on "Secrets of New York City"
Thanks so much for sharing this. I didn’t know it existed. I’ll make sure we visit the next time we’re in the city. Glad I was able to share a bit of unknown NYC history with you. This is fascinating. It’s really disturbing that most of the graves were those of children. Truly disturbing. It is disturbing to know children made up over half the graves there. Conditions were hard, and I wonder if all if it was due to illness or infant mortality. I knew about slavery in new york. Because contrary to popular opinion, slavery was everywhere in the beginning. I am facinated with the history of this. What were the slaves working conditions? Were there more slaves than free? How did the free and slaves interact? DId they? I love history, so I’m going to research this myself. I find it facinating that “wall street” was built by slaves. I always thought making up North was like the goal of slaves. Thanks for sharing this. I too would have never known. Yup, it usually was! I wonder how many just went straight to Canada knowing that there was no real freedom in the North. Wow, I had no idea! Thanks for sharing this! I’ll have to check this out the next time I’m in the city. You are very welcome! You’ll be amazed at how much you’ll learn! I remember learning about this WAY back in the day but it was totally awesome to read a refresher. Thanks for sharing this important info! You’re very welcome Nellie! A reminder is always good, and it’s amazing how much history we can find in this huge city of ours! I never knew that. Like you, I always think of slavery being a Southern thing. It’s amazing the new things you can learn with a little bit of research! It DOES seem like history books wants to separate slavery to be a Southern thing, but yup, it was everywhere, and our whole country relied on it for it’s economic success. I totally know what you mean! I studied African American History in my undergrad studies, and there is just so much information out there that is just not taught in regular schools! I feel like there should be a supplemental class that fills in all the gaps to really make history class well rounded–that or, finally teach all of American History. You are so right – people rarely discuss slavery outside of the south. It was only recently that I learned about how deep slavery was in Jamaica. I had no idea about the NY burial ground. Good stuff here. Thanks for sharing.